The world awaits a huge boom in hydroelectric power plants, especially in developing countries. This could double the amount of electricity generated by hydroelectric plants. On the other hand, a large number of flows without regulation dropped by twenty percent, which will bring another major threat to freshwater species of animals and plants, the report says scientists from Berlin Liebnitzova Institute. Great interest in renewable electricity sparked a flurry of construction activity, described by scientists as a new era of building hydroelectric power plants. Renewable resources are currently involved in the world electricity production about 20%. Energy from hydroelectric power plants while representing around 80% of this amount. The expected rise 3,700 new large dams could double current production to a total of 1,700 GW over the next twenty years. A large number of built or planned dams arises South America, Southeast Asia and Africa, often in areas that have global importance for freshwater biodiversity. 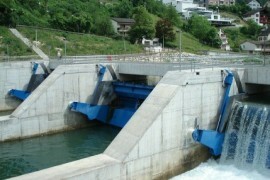 "Hydroelectric power plants are part of the transition to renewable energy, but it is important that new dams did not create new problems for biodiversity, especially due to fragmentation and changes in the flow and deposition of sediments in large rivers," explains Christiane Zarflová team from the Leibniz Institute of Freshwater Ecology (IGB ). If all currently planned hydropower plants actually constructed, world power, although it remained China, but its share of total electricity generation from hydropower would fall from the current 31% to 25%. The largest number of new hydroelectric dam in South America should arise in the rivers of the Amazon and La Plata. In Asia, most of the new water works should arise on the Ganges and Brahmaputra in India and Nepal, as well as the Yangtze in China. "When building new dams is important to follow a systematic approach that includes both ecological and social and economic impacts throughout the flood specific river," says Clement Tockner director of IGB.